I possess a bottle with some brown liquid inside. The metal cap over the mouth of the bottle could be easily popped off, and the brown liquid inside could be tasted to determine if it had spoiled over the years. You see, I purchased the bottle at some time around the year 1990, so it is twenty-some years old. Put two and two together, and you discover that the brown liquid inside the bottle is probably as old as the bottle itself. The bottle contains a type of soft drink, soda or pop (depending on where you live) that was popular in the 1950s and 60s. One little corner grocery store in the town of Hollidaysburg continued to carry it, along with many other outdated brands, into the 70s, 80s and 90s. I could amaze all you readers by stating the exact circumstances of my purchasing the bottle, providing all of the details, beginning with the faint squeaking of the door as I entered the shop, but I don't actually remember anything at all about the visit. One detail that I can surmise is that I probably purchased more than just the one bottle at the time because I probably wanted to drink some of the brown liquid ~ I really doubt that I would have spent any money on a single bottle with the brown liquid inside just to take it home to sit on a shelf - for twenty-some years! The bottle that I possess contains a brand of soft drink that was called Moxie. 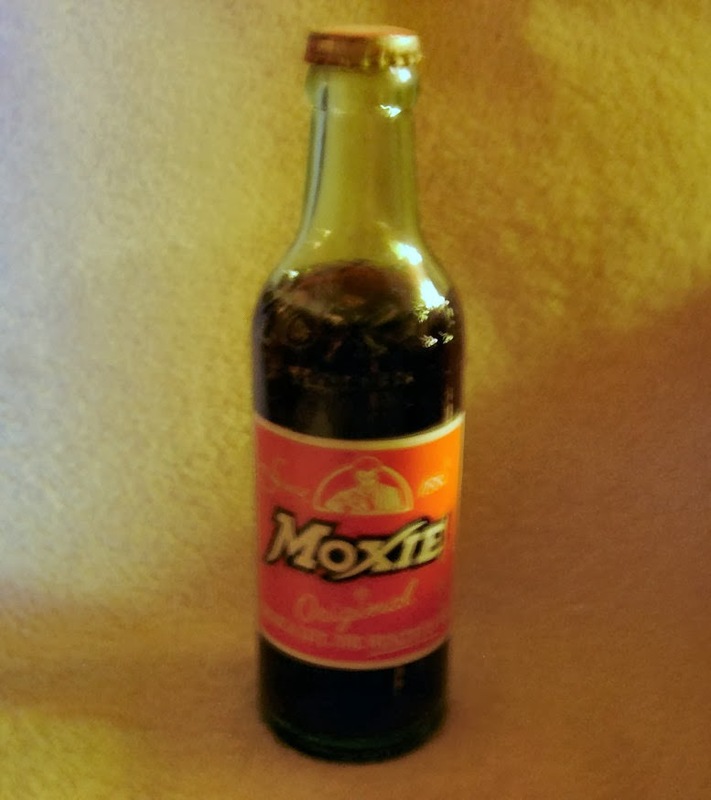 The word moxie is an American slang word. You won't find it as an entry in the Compact Oxford English Dictionary, although it is included in the standard OED. The definition provides two options: 1. An American soft drink; 2. Courage, guts, nerve, energy, pep. The second option of the word provided in the OED certainly gives an impression of the word, moxie, but it really doesn't focus on the unique aspect of the word. The word moxie would not be easily substituted for any of the words "courage, guts, nerve, energy and pep" by themselves. It possibly might work as a substitute for any combination of two or more of those words, though. Moxie was not just a single action, such as 'courage' or 'pep'. It encompassed a variety of feelings and emotions that gave you 'courage'. It expressed the reason you had the 'guts' to face some oppressive situation. Roget's Thesaurus defines the word, moxie, as "the quality of mind enabling one to face danger or hardship resolutely", and then lists twenty-seven synonyms. The soft drink that was sold under the brand name Moxie, was developed from a 'tonic' that was invented in 1876 by a resident of Maine, Dr. Augustin Thompson. The native Indian tribes, who inhabited the region that the English settlers called Maine, knew of and used parts of the moxieberry plant for medicinal purposes for many years prior to Dr. Thompson's concoction. Whether the Indians knew of any beneficial effects of the moxieberry plant is unknown at this time. Dr. Thompson might have known of the native peoples' use of the plant, but he claimed that the concoction that he marketed to "cure brain and nervous exhaustion, loss of manhood, imbecility and helplessness..." had been discovered by a man named Moxie at some undisclosed location near or south of the Equator. 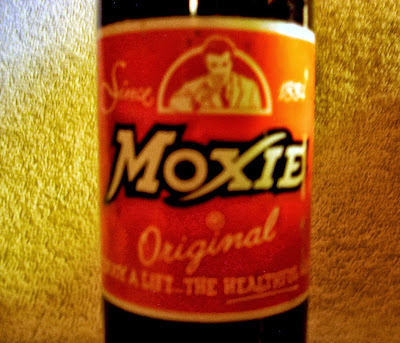 In the 1920s, with the widespread development of carbonated beverages, as a result of the Prohibition movement in America, a company in Boston, Massachusetts began to bottle and sell the soft drink, Moxie, its flavor being derived primarily from the gentian root. The invigorating effects proclaimed by Dr. Thompson for his original tonic became the basis of the marketing campaign for the new soft drink. And so, it was suggested, if you drank Moxie, you would be endowed with the invigorating effects of a tonic, and therefore filled with a resoluteness and strength of being to conquer anything: in other words, you had a lot of moxie. A tiny spinning wheel that sits on a blanket chest in my entryway is certainly no child's toy. The wheel measures only ten inches in diameter. The height of the entire piece to the highest point, which is the tip of the distaff, measures a mere three and one-half feet. It is definitely a small piece. But, like I said, this is no child's toy, despite the fact that everyone who sees it thinks it is. The diminutive spinning wheel shown in these photos would be called a castle wheel, so named for the number of 'spires' that rise upward. Castle wheels could be much larger than this though; that name referred more to the structure than to the size. The aspect of the size is what gives this spinning wheel the more common name of bride's wheel. In the early 1800s, which is the probable date of this bride's wheel, and earlier, when a man and woman married, the woman left her family and moved to a new home, which was the choosing of the man. Oftentimes, the young couple did not have a tract of land in the immediate vicinity of their families, and needed to travel a distance to start their home. The family might have only a single wagon on which to haul all of their possessions. The bride's wheel was created as a small, easily carried spinning wheel. Because of its small size, the bride's wheel is often mistaken for a child's toy. But it is fully functional. The young bride would use this type of wheel until the family could afford to purchase a larger, 'full size" flax wheel. In the images, notice the small white balls on the ends of various turned parts of this wheel. The white balls are actual ivory. Also notice, in the images of the wheel, there are turned half-spokes of ivory between the wheel's black painted wooden spokes.